Hi Friends! 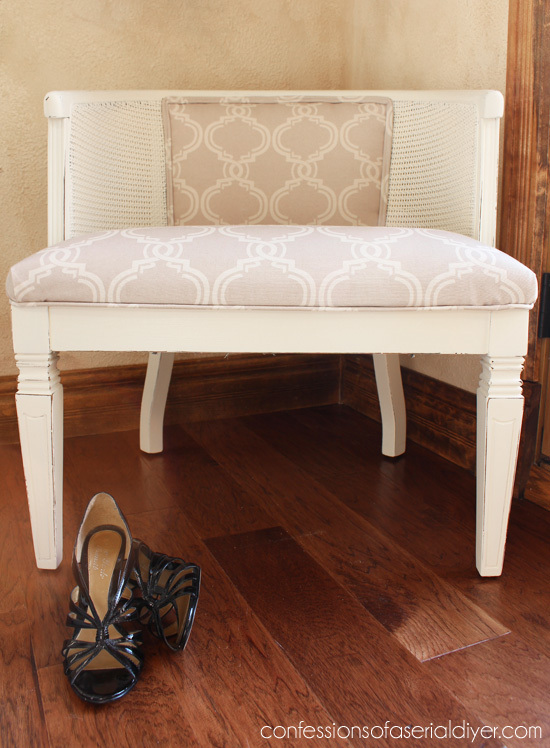 Up for a little furniture redo today? How about this pretty little cane club chair I picked up recently at the thrift store? I spied it at the Salvation Army on a Thursday for $44, and I really liked it so I asked the gal if they were having any sales any time soon. She told me that all furniture would be 50% off on Saturday. Luckily it was still there! It ended up being only $22! Woo hoo. 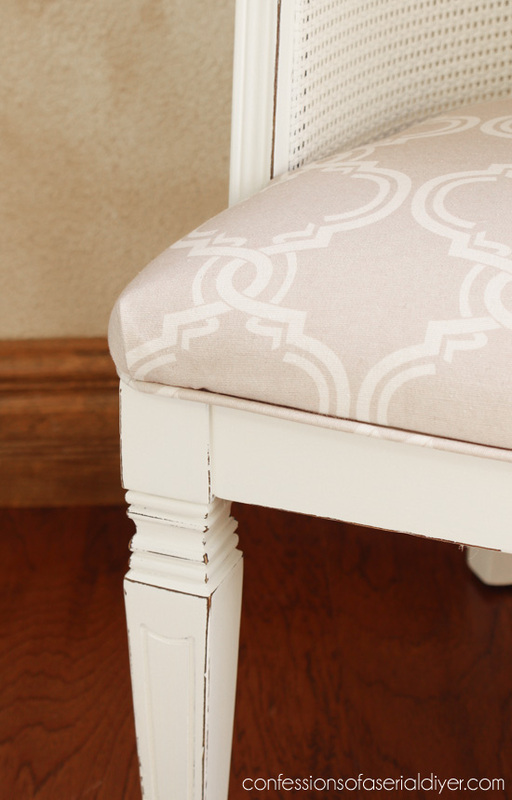 I was tempted to use my favorite French-inspired fabric since this chair also has the same lines as the dresser I recently redid using that fabric. But I had this left over and thought it would be pretty. It started out as a curtain panel from Homegoods! Remember that set? It sold quickly! I took pictures as I went just in case anyone out there has a similar chair they’d like to reupholster. Clean well. I wiped mine down with Lysol wipes. Remove the seat cushion that should be screwed in place from the underside. Remove the inside back panel of fabric first. Remove the foam and outside back fabric panel. Spray prime the cane portion, then follow with spray paint. I used Rustoleum’s Heirloom White. Paint the rest of the chair. 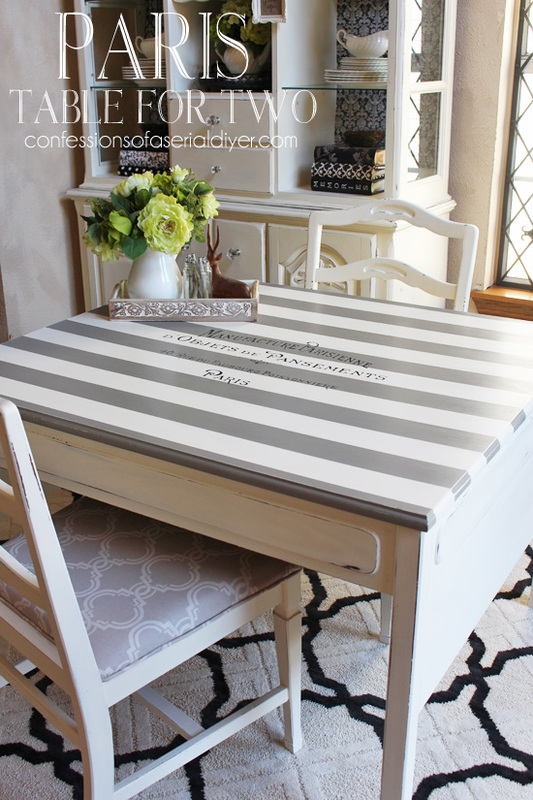 I used my go-to DIY Chalk Paint in Behr’s Cottage White. 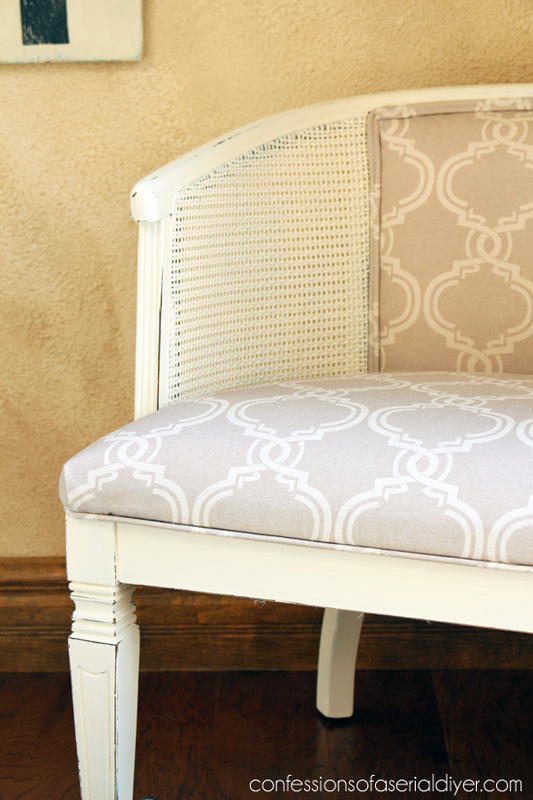 Cover the seat using a staple gun. (I did not remove the old upholstery since it was in perfect condition.) Make double welting (tutorial here) for around the inside back panel. Make piping (tutorial here) for seat portion. 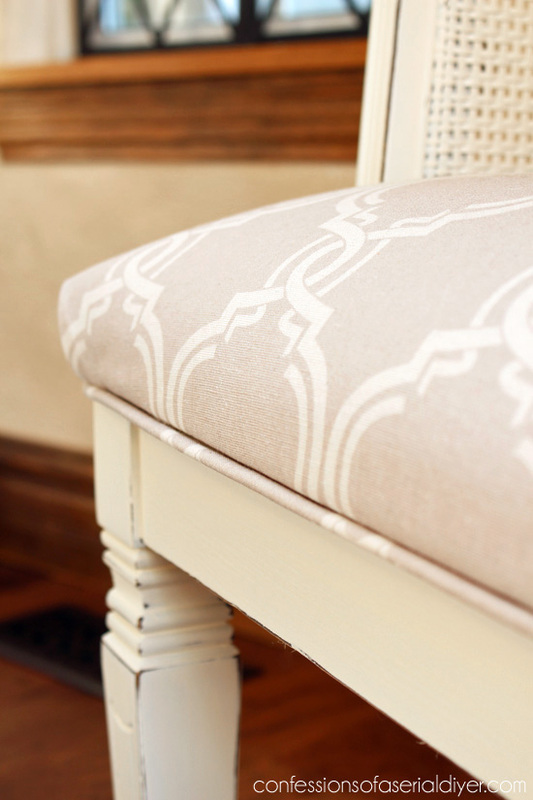 Use the old upholstery panels as a pattern for the new fabric. Attach the outside back fabric using a staple gun. Attach the foam , also using a staple gun. I reused the original foam. Attach the inside back panel using a staple gun. Attach double welting to hide staples, using hot glue. Attach piping to underside of chair using hot glue. Hopefully you get the general idea. This was not hard at all, and don’t be frightened by words like double welting. If you can sew a straight line and you have a Walmart nearby, you can totally make that. Our theme this month for our Get Your DIY On party is Fabric DIYs so I thought this would be perfect! The party fun starts this Sunday, August 2nd, at 7:00pm EST. 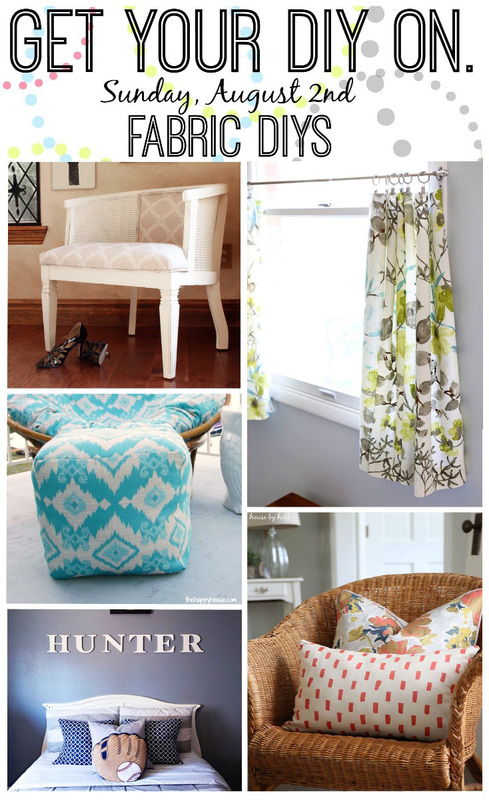 Bloggers, come share your FABRIC DIYS, so we can inspire our readers! I got a lot of mileage out of that one set of curtain panels. I’m using the last of it on a chair for my neighbor. Wow! This is gorgeous what a great job! Thanks for this post! Love what you did with the chair! It looks like you distressed it a bit. Did you use sandpaper? Any antiquing glaze? I have only chalk painted once, so any tips you can provide are appreciated! I was just curious what you would put on a redone chair like this if you had a booth (like I do). Just wondering if it is worth the time… (I would totally do this for me or a friend as a gift!) Thanks for any input–you can email me privately if you don’t want everyone knowing how you price items. Thanks, Norma D.
That chair is perfect to replace the one my dog chewed up! Oh no! That sounds like my husband’s recliner that the cat has chosen as her personal scratching post! Looks great, Christy! I know you were thrilled to score this pretty chair at such a good price. One of these days I will tackle upholstery! I am not worthy to read your blog!!! YOU are AMAZING!!!! Great job! Love the color of fabric that you chose! Thanks for the step-by-step pictures as well. 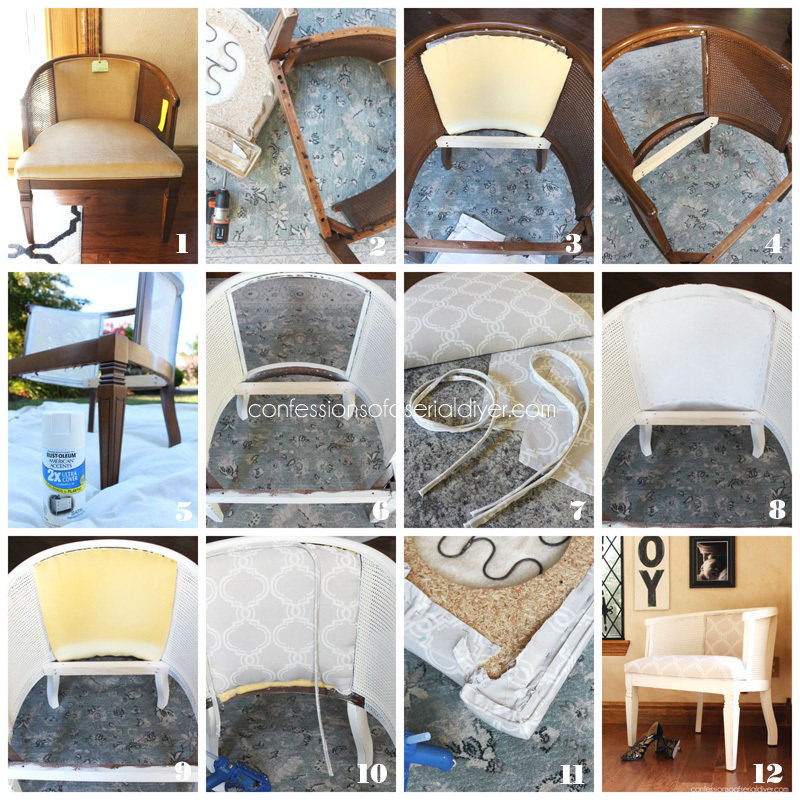 I will definitely be referring to this post when I decide to finally tackle an upholstery project! OMG I LOVE this AND I have two of these chairs the hubs ‘rescued’ from the trash for me (occasionally he follows MY INSTINCTS LOL). The back is tufted so I’m not sure if I’m up to the challenge. They are in excellent condition other than the dog drool our late English Bull Mastiff garnished on them. I took to local shop and it will be > $300 EA to have them redo and I would provide fabric. Wish I lived closer to you! Hi Christy, thanks for your comments and I think I will give it a whirl at least a test on one chair. I think the cost is high as I am in Boston. Whaaaat, no French burlap!!! 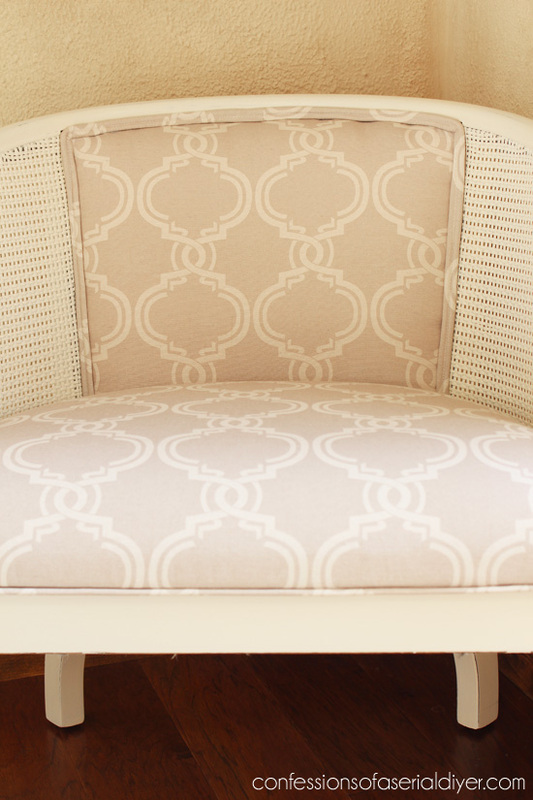 LOL Another beautiful upholstered chair – love this fabric too. Can’t beat $22.00 – I bet you were happy to see the chair still sitting there. 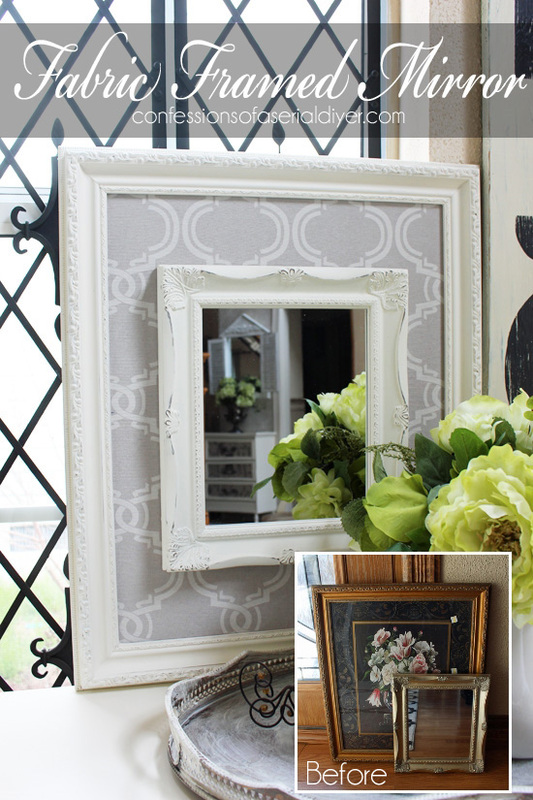 The matching double frame mirror is so pretty too. 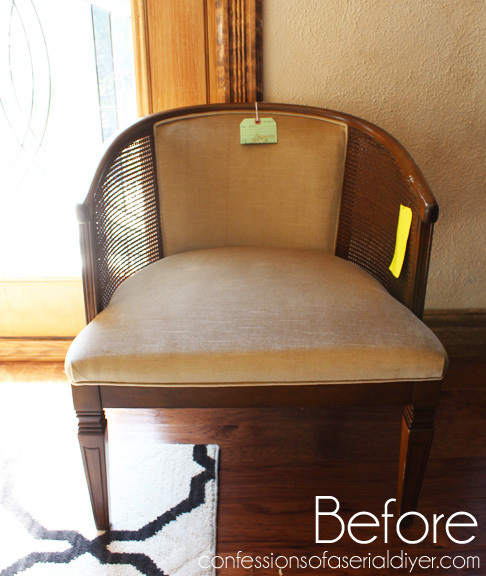 Love how you redid this chair! Fabric and paint color look so nice together. What kind of stapler did you use? I have almost this identical chair waiting for me to rip it to shreds and give it a makeover. Thank goodness you just taught me how to do it! 😛 Of course, I’m plastering mine with owl fabric. Beautiful! Stunning!! Great job!! Can’t wait to tackle my own chair project and love the frame/mirror project as well. Thanks!